Hello Friends, my readers, good day to one and all. I've a happy news to share with you all. It might not sound a big deal to many but it is for me. Let me straight away tell you what it is, yes, my page FB page Kitchen Secrets has reached the big milestone of 1000 likes 2 days before. woohoo... Omg, I's awestruck when I saw that number on my page, I really thank you one and all from the bottom of my heart , I also requests your love and support for the days ahead. Thank you guys, this really is a big deal for me. I wanted to post something sweet for the occasion but u know I had to share this recipe as it was requested by few of my readers. Also this is a holy month for me, as it is Purattasi, we'll make a grand feast esp on every Saturday for the whole month with almost all the veggies for Lord Balaji. So, I thought it will be more apt for tomorrow. But surely I'll share something sweet , preferably a dessert , for this occasion. I once gain convey my thanks to you guys..Yayyyy..
Pressure cook the toor dhal with the turmeric powder, hing add 1/2 cup of water to it and cook for 3 whistles. Slightly mash the dal and keep aside. Add the tamarind paste, sambar powder, salt in a bowl and mix with 1/2 cup of water. Keep aside. Heat 1/2 tsp. of oil , add the shallots, fry until it's translucent. Add in the chopped tomatoes, cook for 2 minutes. Now add in the tamarind water to this and give it a boil. Now throw in the drumstick leaves slowly and mix well. Let them cook for a minute or two. Later drop in the cooked toor dhal and mix well. Let them boil for 4 minutes. 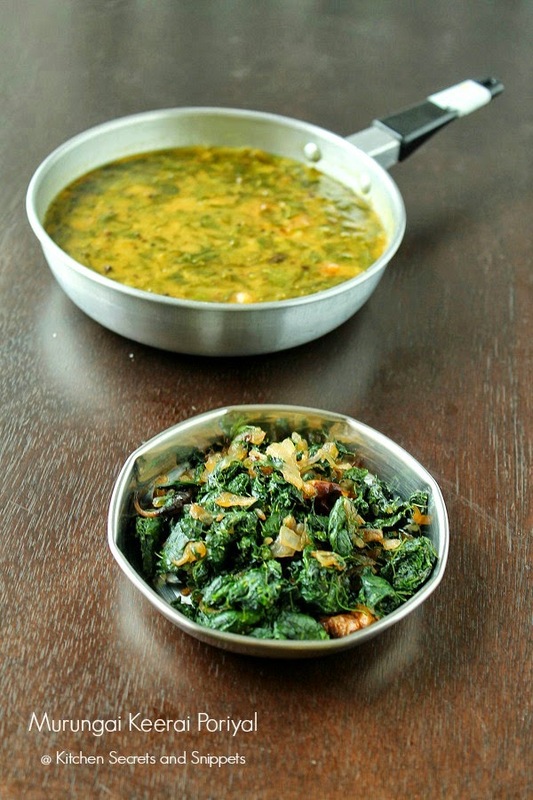 Do not cover the pan at any point of time as it is not allowed while cooking greens. Heat a small pan with oil and add the vadagam or the other seasoning ingredients and fry them on a low flame until it is finished popping. Add the curry leaves. Transfer this seasoning into the boiling kulambu. Mix well and switch off. 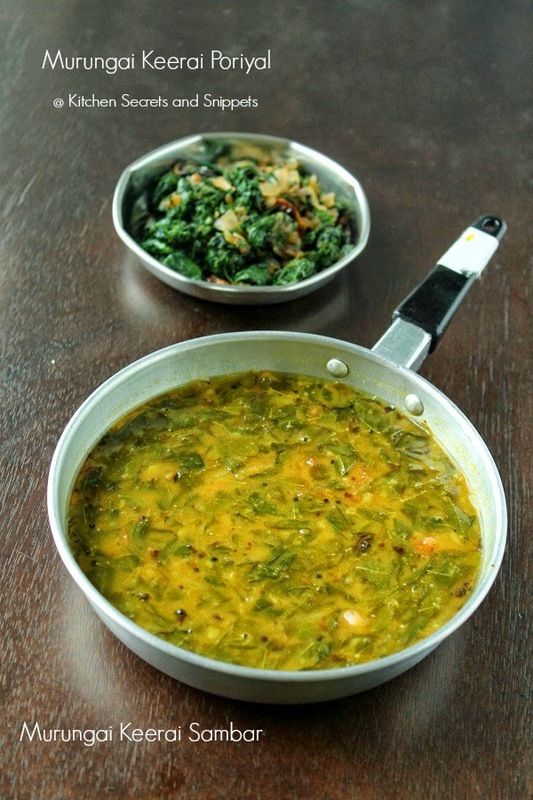 Heat a pan with oil and fry the urad dal until it turns golden. Then add the more milagai and fry well. Later add in the chopped onion and scald well for few minutes. Now throw in the cleaned drumstick leaves and slowly mix it. Now add the salt and sugar and mix throughly. Cook the leaves for 4 to 5 minutes on medium flame. Do not cover the pan at any point. Switch off the heat. Remove from the stove . Add the shredded coconut and mix well. I did not add coconut as my family doesn't like it. Serve hot with rice. 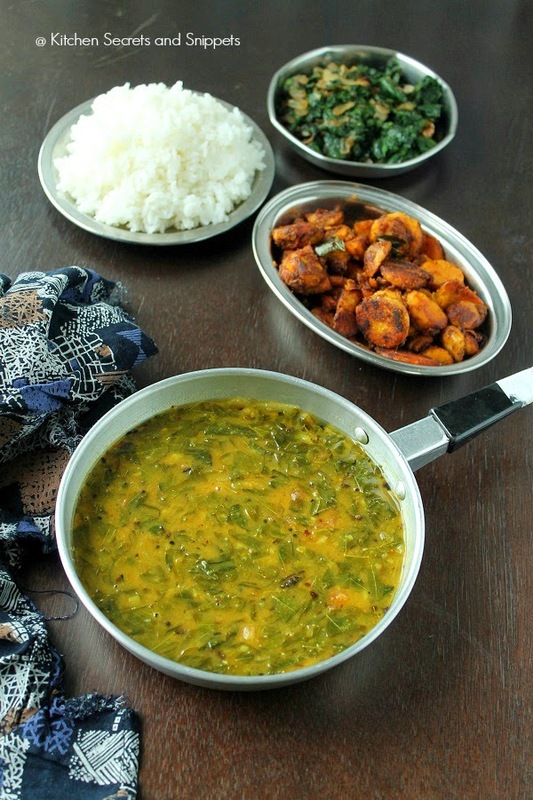 Healthy and tasty looking sambar. Feeling hungry just by checking the pics. 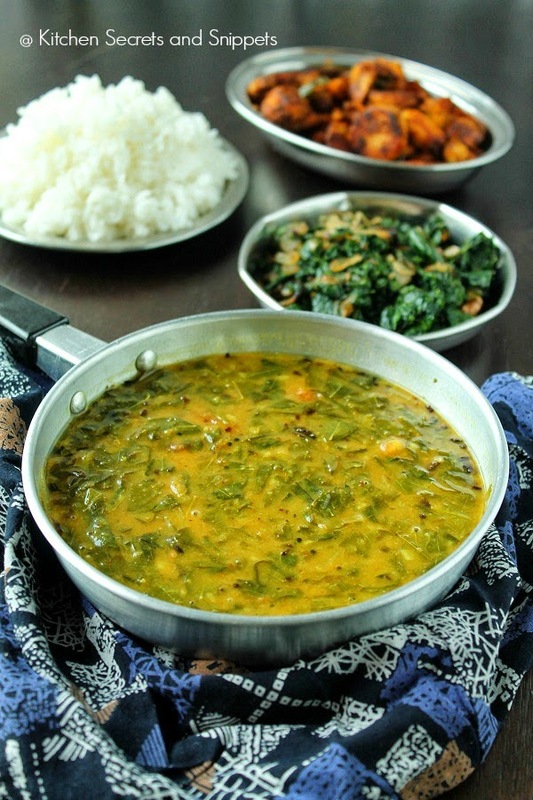 I love drumstick leafs.. it is hard to find here.. sambar looks very tasty..
Wow...my all time favorite.. zinc riched food..love it dear! 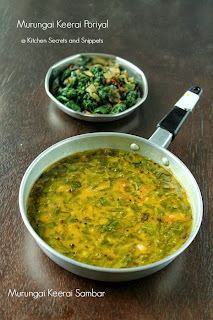 Healthy sambar and poriyal, looks delicious.